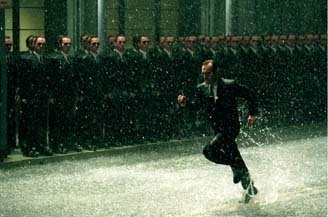 As the title would indicate, this final installment of The Matrix trilogy will likely focus on an all-out war between Neo and his comrades and the evil computer mega-reality known as The Matrix. Being filmed simultaneously with The Matrix Reloaded, Revolutions is set to debut in theaters in November 2003, just ahead of the final installment of the Lord of the Rings trilogy, Return of the King. It is heavily rumored that the trailer for this film will be released at the same time that the trailer for Reloaded will; either that, or they will both share a long teaser trailer much in the same way that the first trailer for LotR advertised all three films. With the report that the trailer(s) will be attached to Attack of the Clones, the film is set to have a high-profile kick-off to its ad campaign. Returning to the film are the usual cast of characters: Neo, as played by Keanu "Whoa" Reeves; Morpheus, as played by Laurence "Don't call me Samuel L." Fishburne; and Trinity, as played by Carrie Ann "Dodge This!" Moss. The highest profile addition to the film is Jada Pinkett-Smith, who will take on the role of the love interest for Morpheus. Ten months and over $300 million into the Year of The Matrix, the jury is still out on Neo and friends. Whether it was due to heightened expectations or just a disappointing overall package, The Matrix Reloaded was greeted with much hoopla but failed to connect with its audience like its predecessor did. Now with The Matrix Revolutions just around the corner, hope springs eternal that Revolutions will surpass both its predecessors in quality and overall impact.